Okay, you’ve picked out the spot. You know where in your garden you want to situate your coop and outside pen. You’ve carefully assessed the size of a chicken flock that is best for you. Enough space: Chicken coops must follow the suggested square footage-to-bird ratio for the number of chickens it houses. Overcrowding of chickens causes stress and pecking, and it makes them more susceptible to disease and injury. 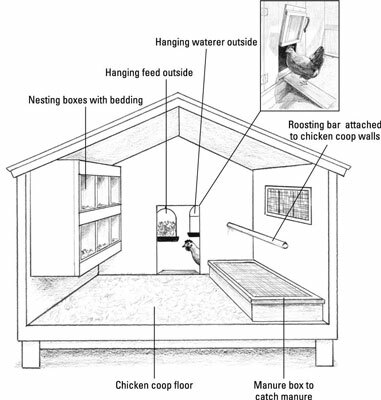 Good ventilation: A well-ventilated coop has windows, doors, and vents that are adjustable to allow air to circulate. Chickens naturally give off ammonia and moisture in their droppings, which build up without removal and adequate air circulation. Excess moisture can cause mold and mildew and a nasty medium for disease organisms. Free from drafts: Drafts are a constant unwanted air blowing that can cause chickens to get sick. Sealing a leak, erecting a barrier wall, and paying attention to the cause of a draft can correct drafts. Proper Temperature Control: Chicken coop temperatures can fluctuate throughout the day and throughout the year with the different seasons. Access to a chicken coop can help shelter chickens from heat in the summer and cold temperatures in the winter. A chicken’s body operates optimally between the temperatures of 70 to 75 degrees Fahrenheit. Chickens are however surprisingly adaptable to a wide range of temperatures, from sub-freezing to heat over 90 degrees Fahrenheit. It is wise to raise chicken breeds suitable for your climate, especially if you experience high heat or very cold temperatures. Temperatures between 40 degrees Fahrenheit and 85 degrees Fahrenheit are considered suitable temperature ranges for chickens. When suitable temperatures are exceeded, either hot or cold, chickens will change their eating habits and stop laying. Chickens don’t have the ability to perspire. In hot weather, chickens keep themselves cool by “pant breathing” with their mouths open and holding their wings out and away from their bodies. Their wattles and combs also help to keep them cool. When temperatures exceed 95 degrees, chickens may start dying. When temperatures approach freezing, chickens will eat more to obtain energy needed to maintain their bodies and to keep themselves warm. In cold winters, it helps to have your chicken coop roof and walls insulated. Consider adding bales of straw for extra insulation and protection on exposed sides of a chicken coop. In freezing temperatures, make sure your chickens have ventilation but no drafts to counter the moisture in their manure. It is critical that their water remain free-running and not freeze. In some instances, a simple red heat lamp carefully placed and safely secured against fire hazard can keep water from freezing and heat a chicken coop. A chicken coop may not need to be heated, and a heated chicken coop may not necessarily be healthy for a flock. It depends on your climate, weather, and circumstance. Sturdy construction: Chicken coops need to protect chickens from extreme weather, hot sun, heavy rain, and snow. They must be sturdy enough to carry weight and withstand blustery winds. Good drainage: Chicken coops shouldn’t be situated in low spots on your property or garden. A chicken coop should be located where drainage is good and not around wet or problem areas of your garden. Elevate a chicken coop off the ground at least 1 foot for many reasons. An elevated coop ensures air can circulate around the coop, can prevent flooding in flood-prone areas, and prevents rats and mice from nesting. An added bonus of an elevated chicken coop is that it can serve as a structure for free-ranging chickens to escape under from predators. Cleanliness: A chicken coop should be easy to keep clean. It needs to be free from dust, dirt, and cobwebs. Its roof should be watertight. Make sure it doesn’t have any holes for mice and other rodents to get in. It shouldn’t have any nails or sharp objects sticking out that could injure a chicken. It should have a solid floor made out of wood or concrete. A layer of bedding — such as pine shavings, rice hulls, or straw — makes a nice cushion for inside nesting boxes and the floor of the coop. In addition to having the proper features for maintaining a healthy flock, chicken coops need to be positioned correctly in your garden. Chickens respond well to sunlight for their egg laying and overall health. Egg production is stimulated by daylight length. Position your chicken coop and outside pen to access natural light, but don’t forget to provide shade during the hottest months of the year with shade cloth or landscaping. Chickens do best with fresh water at all times and a source for formulated laying mash. A chicken coop helps keep their water clean and their feed dry and protected. Wet feed can become moldy, get rancid, and attract unwanted bugs. Don’t give chickens wet or moldy feed. A chicken coop should provide access seamlessly to an outside pen or the outdoors during the day. Chickens need access to their coop for their nesting boxes and laying their eggs. Sand is a nice material that chickens love and is good for drainage in an outside protected pen.